The Free Logo offer is available on any order over 200m², allowing customers to choose a logo, emblem or message to incorporate into their scheme in up to four colours within a 500mm x 500mm area. SureSet’s permeable paving systems deliver great aesthetics and low-maintenance performance and with a wide range of colour options, the design options are almost limitless to create long-lasting paths, access roads, driveways, courtyards and entrance areas as well as showrooms, offices and reception areas. The addition of a logo provides a distinct touch of individuality and personality to any scheme, with schools, offices and health centres across the UK having already benefitted from this SureSet service. Commenting after the show, SureSet’s Senior Marketing Coordinator, Yvonne Philp said: “We were delighted with the reaction we received at Ecobuild, both to our range of permeable surfaces on display and to the new services that we launched at the show. 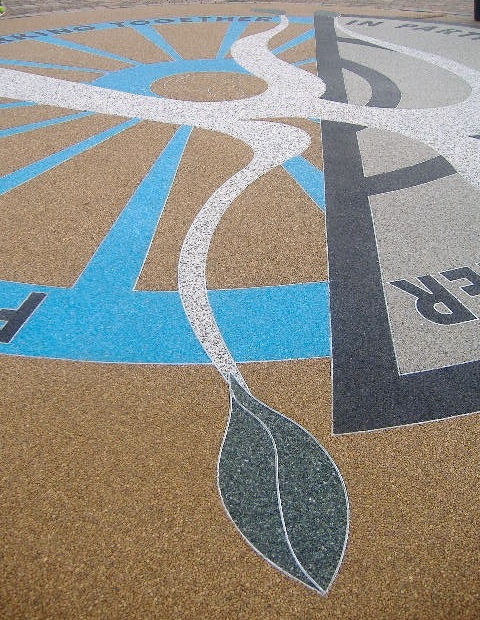 “Having spoken to a number of architects, we put together the new CPD presentation to contain a mix of project, product, design and installation information to provide a general introduction to resin bound paving. Our Free Logo offer has also provoked a great deal of interest and we’re looking forward to installing some really individual schemes over the coming months”. For more information on the company’s extensive product range, or for details of the Free Logo offer and CPD presentation, please visit www.SureSet.co.uk or call the company’s experienced support team on 01985 841 180.